Complete Self-Defense Training Available Now! Learn Self-Defense and Stop Fearing Criminals! Fact: You can avoid 90% of dangerous situations just by being more aware of your surroundings. This video will teach you how to detect and react to possible dangers before you walk into them. Most attackers can be talked down from fighting you. Learn the words and the body language required to walk away from what could be a lethal encounter – or buy you enough time to strike first and survive. You can't make the most of offense or defense with a poor fighting stance. This video will show you the most effective fighting stances that work in the street – and how to master them. In a confrontation, it's essential to remember how and when to move. Proper footwork is required for solid offense and defense. Learn proper grounding and positioning tactics to avoid being knocked down – it's critical to stay safe! There is more to striking than just making a fist. This video will teach you how to maximise speed and precision, hit hard without hurting your hands, and instantly go from a powerful strike to another! Most attackers in the street use similar attacks and patterns. Learn and practice the counters to each, and an attack will no longer shock you! This video contains life-saving information. Act now! If you end up on the ground in a street fight, you highly increase your chances of getting injured. Use the advice from this video to fight back from the ground and quickly regain your fighting stance. Larger attackers are extremely imposing and dangerous because of their size and strength. This video will teach you the best ways to defend against much bigger and taller opponents. Most lethal attacks are committed by knife attackers. Unless you are trained to protect yourself, you can get badly injured or killed in a knife attack. If you really want to stay safe, don't miss out on learning knife defense! In a street fight, you have to be concerned of having more than one dangerous person attack you. You MUST WATCH this video – It will teach you how to handle two or more attackers at once in a realistic, and effective, way! A belt, a chair, your car keys – anything can be used as a weapon in a street fight, if you know how to use it. Apply the lessons from this video, and you'll never feel defenseless in a life threatening situation again! Fighting an armed attacker is a lot tougher, even if all he has is a screwdriver or any other weapon. Learn strategies to trap and disarm opponents, no matter what they swing at you; a bat, a crow bar, a hammer, an axe; you name it! A stick in skilled hands can do a lot of damage! You can use it to strike, trap, block, deflect attacks, and fight multiple assailants – if you know how to use it. And after watching this video, you will! Surprisingly, even at gunpoint, you're not helpless. This video will give you life-saving tips on how to protect yourself from an armed and dangerous attacker including how to draw him in to remove his weapon. Download All Videos on Your Hard Drive. 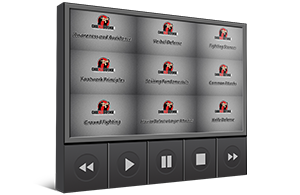 Want to get all the self defense videos to watch and learn at your own pace? No problem! This package includes all 14 official videos and the exclusive bonus video "Inside the Criminal Mind". You will receive a secured link to download the entire Code Red Defense™ video collection! These essential videos will help you learn and practice the most complete self defense training course available today! Note: You need at least 20 GB of available hard drive space (PC or external hard drive) to download the videos. Instant download!